Web Japan > NIPPONIA No.33 > Five-story Pagodas: Why Can't Earthquakes Knock Them Down? Japan is famous for its old wooden buildings. 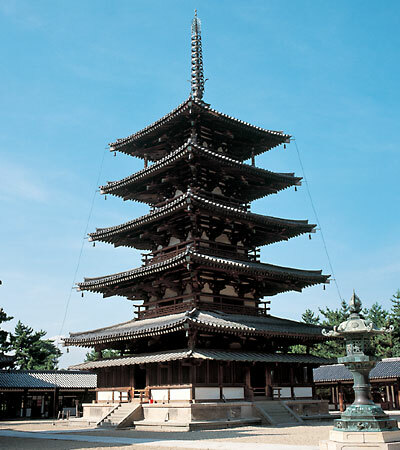 Some, which we could call ancient " high-rises," are five-story pagodas at major temples in places like Kyoto and Nara. Stupas were first built in India to enshrine remains or relics of the Buddha. The custom of building stupas was transmitted via China and the Korean peninsula to Japan. There, more than 1,300 years ago, the shape became the distinctive five-story pagoda. Earthquakes occur frequently in Japan, but five-story pagodas keep standing, as beautiful today as they were centuries ago. What secrets does the pagoda have, protecting it from seismic forces? The five-storied pagoda at Horyu-ji Temple. Some of the temple buildings are the oldest wooden structures in the world. Many earthquakes and windstorms have tested them, but they still stand as they were built about 1,300 years ago. The five-story pagoda is a strange piece of architecture  Japan experiences many serious earthquakes but there is almost no record of a pagoda being knocked over during one. The Great Hanshin Awaji Earthquake of 1995 brought down many tall modern buildings in the Kobe area, but not one of the 13 three-story pagodas in surrounding Hyogo Prefecture was damaged. What secrets protect three- and five-story pagodas from earthquakes? The first secret lies in the material used  every structural part of the five-story pagoda is made of wood. When wood is subjected to a force it may bend and warp, but it does not break easily. And when the force is removed the wood returns to its former shape. Because it is flexible, it can absorb seismic stresses. The second secret, a structural one, complements this flexibility of wood. The timbers are fastened together, with hardly a nail at all, by inserting carved thinner and narrower ends into slots. So if the ground begins to shake, the wood surfaces in these joints twist and rub against each other. This helps prevent the seismic energy from traveling far up the tower. There are about a thousand large mortise joints in a five-story pagoda, making the entire structure practically as flexible as konnyaku (see Note 1). The third secret has to do with the layered structure of the pagoda. If you stand a long slab of konnyaku on end it will not remain upright, but five cubed pieces placed in diminishing sizes one on top of the other will. In English we say "five-story pagoda," but the Japanese word, go-ju no to ("five-layer tower"), is more accurate because the pagoda is basically a number of box-like structures laid one on top of another, much like the traditional stacked-up boxes called jubako (see Note 2). The "boxes" are all fastened together with mortise joints. When the ground shakes, each of these box layers sways slowly and independently of the others. Note 1: Konnyaku is a firm, jelly-like food made from the tuber of a plant in the Araceae family. Note 2: Jubako are wooden boxes for holding food. They can be stacked one on top of the other by fitting the bottom of one box in the rim of the box below. Example of lateral movement in a pagoda during an earthquake. The lowermost box-like structure leans to the left, the one above it to the right, the one above that one to the left, and so on, something like a person doing a snake dance. The weights at the two ends of the cross arm of a yajirobe balancing toy exert equal forces from opposite sides of the fulcrum, keeping the arm level. If the weight on the left side is pushed downward, the horizontal distances from the fulcrum to the two weights become unequal, (see (1) and (2)). Because distance (2) is now longer, the weight on the right will exert more downward force and bring the cross arm back into equilibrium. Thus, every vertical displacement of the weights finally results in a return to horizontal.